A relic of an era when everyone smoked all the time, the bronze toilet ashtrays at Marie's Olde Towne Tavern are still very relevant considering everyone at Marie's smokes like it's 1967. I guess nothing gets outdated if you never change. Photo taken Saturday night while hanging with Wigshop founder Stan at downtown's best tavern. 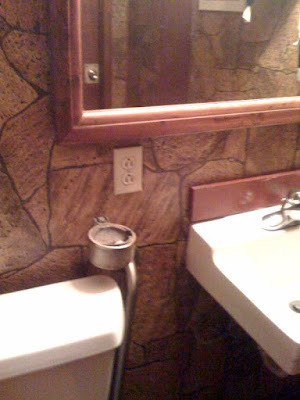 And they have upside-down outlets, like my apartment! So aggravating! Tee-hee...everyone's taking pictures of the ash trays in Maries.